There are four faces of old Lobanillo, which straddles East Texas’ oldest highway less than 20 miles from the Texas-Louisiana border. But overriding the name is the fact that the site is considered to be one the oldest places continuously occupied in East Texas. First, of course, was La Lobanillo, the pueblo of Gil y' Barbo, where his mother and other refugees remained when Spain evacuated colonists from western Louisiana and East Texas in 1773. When Lobanillo exchanged hands, it was known as Shawnee Village and later as Jimtown, a name shaped after the first names of Jim Halbert and Jim Willis. And, finally, along came Geneva, today’s name for the town at the intersection of El Camino Real (Texas Highway 21) and Farm Road 330 in northwestern Sabine County. To tell the town’s story, you have to reach back to when Gil y' Barbo was born at Los Adaes, Louisiana, then the provincial capital of Spanish Texas, in 1729. His parents were colonists sent to Texas the same year from Andalusia, Spain. At Los Adaes, Gil y' Barbo married Maria Padilla and they settled on Lobanillo Creek in what is now Sabine County. They called their place Rancho Lobanillo. When Spain recommended the abandonment of its missions and forts in East Texas, Ybarbo became the leader of the displaced persons of the area, who were given the choice of settling at San Antonio or the Rio Grande River. When Gil y' Barbo petitioned Spanish authorities to let the settlers return to their homes in East Texas in 1774, they were allowed to travel as far east as the Trinity River, where they founded the town of Bucareli in present-day Madison County. But Gil y' Barbo and his fellow settlers soon abandoned Bucareli and went to what is now Nacogdoches, where he is credited with laying out the town. He died at his home on the Attoyac River near Nacogdoches. Lobanillo apparently did not have a post office during the Republic of Texas years, but on July 23, 1884, a U.S. post office was established with the name Geneva and William W. Johnson as the first postmaster. In the latter part of the 1800s, Geneva began to grow and soon had a population of 150. It acquired several cotton gins, a gristmill, a hotel, two churches, a livery stable and at least five stores. Sabine County’s first independent school district was organized at Geneva in 1904. During the 1934-1935 school year, the community had 351 students. 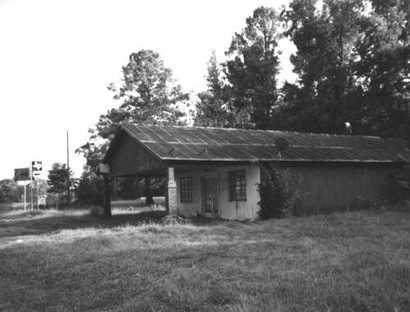 The town lost its post office and the last cotton gin in Sabine County was operated by Joe Harris at Geneva until it went out of business in 1959. Today’s Geneva has only one store, a cluster of homes at the intersection of its two highways, and a number of collapsed buildings. All Things Historical September 29, 2008 Column.